Simple yet elegant come to mind when setting your eyes on this tassel necklace. Hanging fairly long, this sautoir is perfect for layering and wearing with your favorite dress or sweater. This creation started when a client provided me with her enamel tassel pendant, which was in need of restoration. Additionally, she expressed a wish to transform the pendant into a necklace. 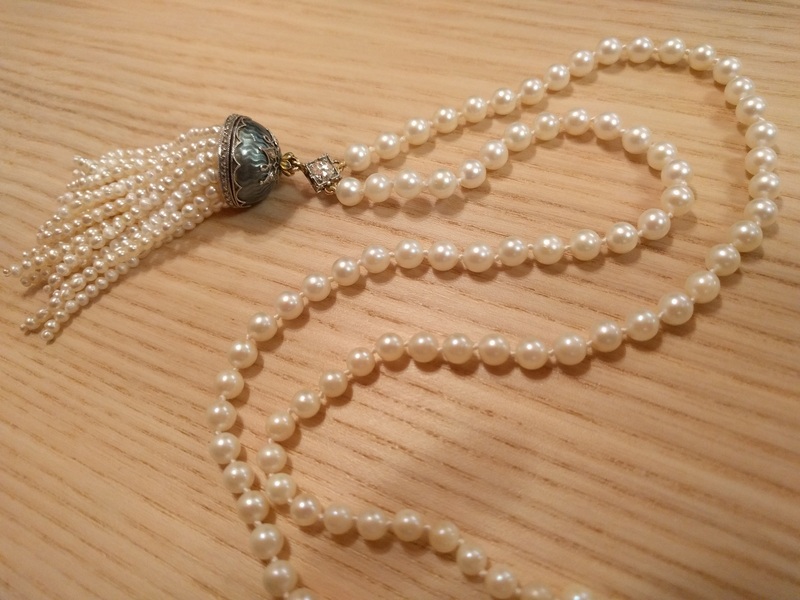 To do so, I incorporated a gorgeous diamond centerpiece to join the tassel pendant with the hand knotted graduated pearls. The client was thrilled to be able to wear the pendant as a much more versatile piece to complement her wardrobe. RachelsDesign specializes in custom made jewelry. If you are interested in learning more feel free to contact for more information!